Justice League 3001 #8 came out this week with an issue titled 'A New Beginning'. Anyone who has read this blog for a while will know that I am a sucker for 'bold new directions' and will most likely pick up a book where that is splashed on the cover. This issue is a new beginning for this book. The team is different. Suddenly we have an all female team, united against a new threat. I almost feel, for better or for worse, that we will be putting a bunch of the mysteries of the early issues behind us, maybe never to address again. I am going to miss Beetle, Booster, and Turtle Jimmy Olsen. Will we see the vengeful Lois Lane/Ariel plot finished? Will we see her Injustice League with Bane and the others? But this is book where I am introduced to Lady Styx, a new villain who is mysterious and intriguing. And Giffen and DeMatteis are sliding some Legion of Super-Heroes into the book! As one of their fandom, I have been clamoring for any sight of them. 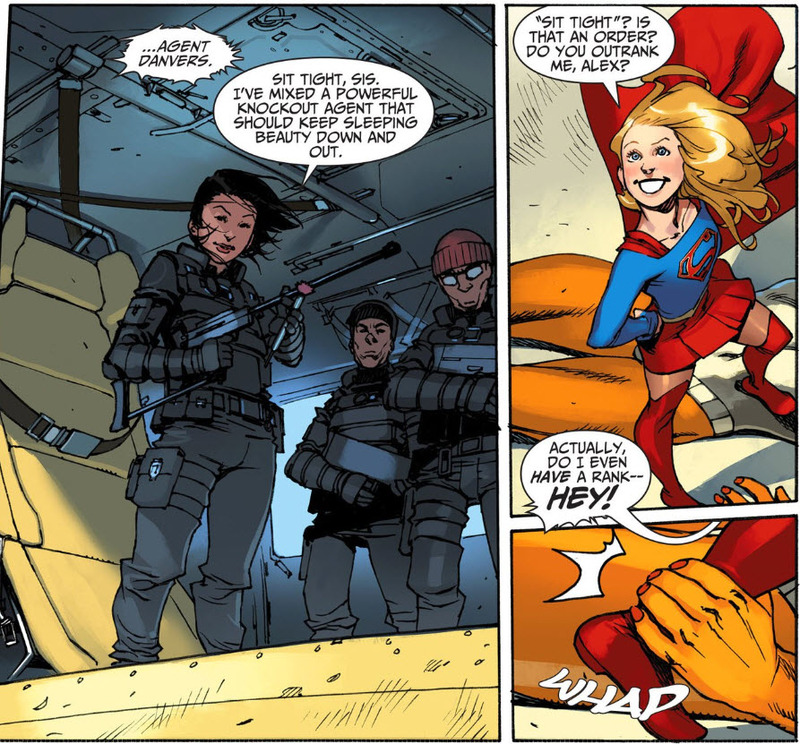 For me, most importantly, I get to see Supergirl leading an incognito League against a universal threat is great. And since her introduction in the book, Giffen and DeMatteis have thrust her into a role of leader, even if she is still a youngish Kara. Seeing her come to terms with this, seeing her 'replacing' Superman (a theme which has been part of her character since 1959) is wonderful. Scott Kolins is on art and brings a sort of grungy dystopian sensibility to the book. He also redesigned some of the costumes the heroes are now wearing. I love Supergirl's new look which has a feel of the 70s Adventure Comics look, but includes red shoulders like the Crisis-era Kara. And the cape, a giant S-shield, is pretty cool. Last issue the Scullions swarmed throughout the universe, taking over the universe in the name of Lady Styx. Only some of the heroes escaped. And now the League is basically on the run. Six months have passed since that last issue and we see how the members of the League are all living incognito on Takron Galtos, biding their time until they can strike. Diana is a welder on a construction crew (shades of the Bombshell 'Rosie the Riveter'?). The Flash is still suffering from PTSD. Ice and Fire are living together, using passwords to ensure safety. And Kara is living alone, wondering how it all happened. Styx had been infiltrating planets all along and simply took over. That second panel, a small Kara, small, alone, framed in a box in a box. You just get the sense of how imprisoned she feels, how claustrophobic this life must be. Each member does have a transversal which allows them to head to their 'headquarters', a demolished Paradise island, the temples and columns in ruins and overgrown. In this sequence, Giffen and DeMatteis give us a quick rundown of how all the members feel. It is like a rapid fire character check to set the stage for how they all feel 6 months into this secrecy. It is clear this team is still a bit in disarray and hardly a Justice League united. Diana is impatient and wants to rush in and fight. Fire agrees. Ice wants to do what's smart. And Guy, whose personality is slowly being erased by his host body's DNA/personality, thinks planning is important. Is that Guy or Shirylalla that is the voice of reason? But there is Kara at the end, arms folded, taking charge and saying that they need to wait. 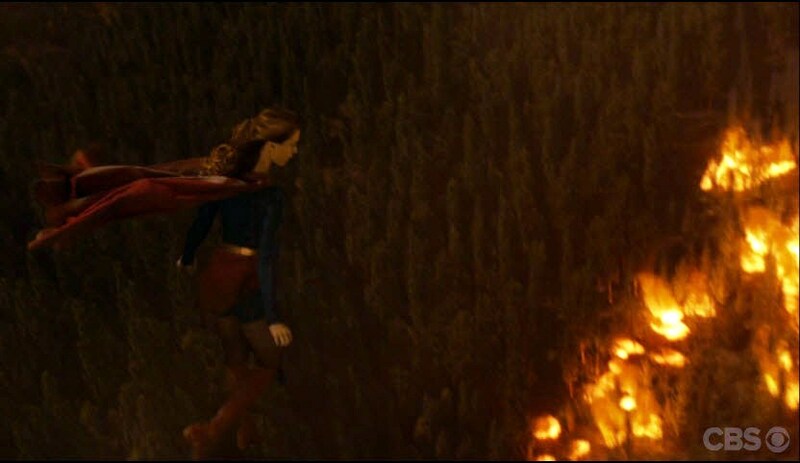 Even in this sequence, it is clear Supergirl is the leader here. She is the last to talk. Her panel is bigger, implying she is bigger. So much information given in the page layout. There is one other member, Batman, who is the most impetuous of the group. She is off trying to destroy the indestructible Scullions. Supergirl needs to teleport in and get Batman out before things go south. I like the mecha-look here. But what I like is that, of all characters, it is the Batman character who is the most hot-headed, the most like to rush in blindly, the one who doesn't want to plan. It is the concept of Batman flipped on its head, a nice addition to a book like this. Remember Batman is actually Tina, a school age girl and descendant of Bruce Wayne. She's brilliant and hot-headed. 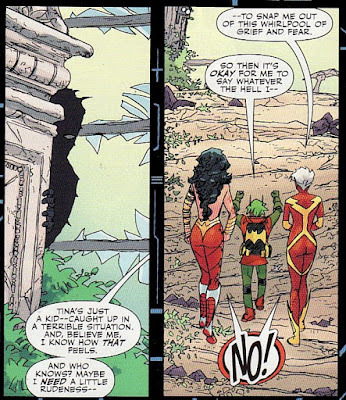 I guess it makes her more of a Damian character which is reinforced in my mind when we see her dressed in Robin garb. Diana and Teri have to tell Tina to slow down. That rushing into battle is foolish. Diana has to begrudgingly agree that Kara is right. I do feel bad for Teri who is still suffering from PTSD, decompensating whenever she sees Scullions or is reminded of Clark's death. We do see that the headquarters isn't completely safe. Someone is skulking in the shadows, watching the team. Who could that be? Guesses at the end. The team is splintered even further. Fire and Ice feel like a separate faction within the team. They feel like outsiders and Ice wonders if they should just leave. These two were part of the 'Bwa-ha-ha' League as was Guy. So it made sense to me that Guy approaches the two and says he needs them and will be part of their subgroup. It is only the memory of Ice which seems to be stemming the personality re-write, reminding him that he is Guy. I think that is a nice touch. This isn't the headstrong Guy. He is scared of disappearing. One quibble here. Fire talks about Guy striking Tora a few days earlier. Now we did see Guy slap Tora last issue but isn't that 6 months ago? Unless Guy is a serial slapper, it shouldn't be so recent. I have commented how it was implied that Supergirl is the leader here. We are told she is the leader later in the issue. And I love the characterization here. First off, I like the fact she keeps the pictures of the dead Leaguers on the wall, a reminder of what she has lost. She also is worried that she isn't ready for this leadership role. She can see that the team is looking to her for guidance and she worries she won't be up for the challenge. 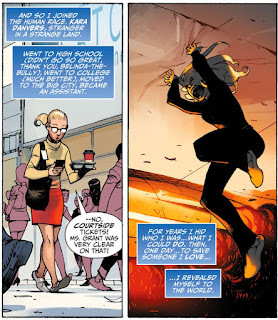 This feels like a classic Kara who is striving to be the best she can be, is ready to step in for Superman, but is still growing and maybe a little unsure of herself. But she won't back down from this responsibility. Fists clenched, she is determined, showing that fierceness of character I love in her. Love this new Supergirl costume. The red shoulders harken back to her Crisis-era costume. But the reversed yellow/red of the s-shield with the high collar and knee-high boots is groovy. As is this cape. Kudos to Scott Kolins for the design. 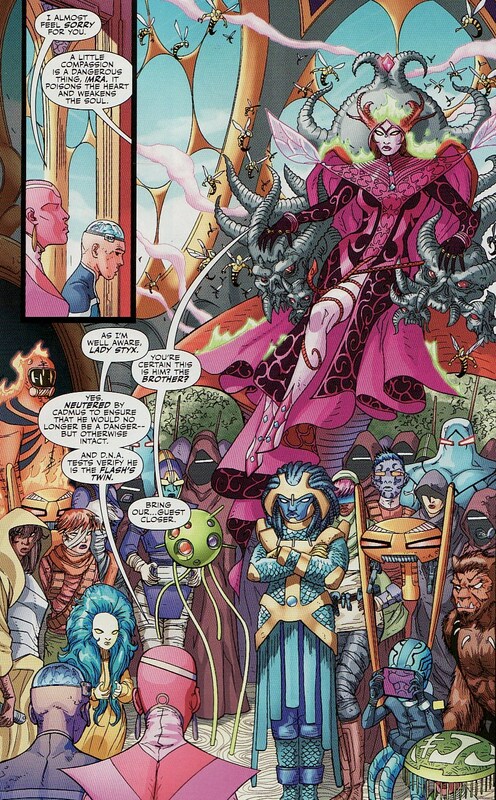 We finally get to meet the lead villain, Lady Styx. In flashbacks, we see her simply announce that she is taking over the galaxy. Her army has been in place for some time. Her ascension to power is simply 'the period at the end of a sentence'. Love that line. 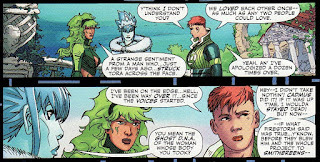 Styx is on Naltor (Dream Girl's home planet) and has a drone version of Saturn Girl go and fetch Terrance, Teri's brain damaged brother who was a key character in JL3000. There are odd acolytes in front of her. One could be Wildfire or Timber Wolf. Are Giffen and DeMatteis slipping the actual Legion into this book? Why not? So many continuities have been woven into this book. I miss the Legion. I really don't want them to be evil. So that makes me wonder if the shadowy figure could be a 'good' Legionnaire. Shadow Lass? Cham? In the end, I think my guess is that it is Ariel/Lois. The enemy of my enemy is my friend. As for Styx, she is a wild character. There is some Kirby Thor elements here. My first thoughts were she reminded me of Karnilla or Hela. But then I wondered if there was some Gemworld in here. And given the Legion element and this being Naltor, could she be an evil White Witch?? 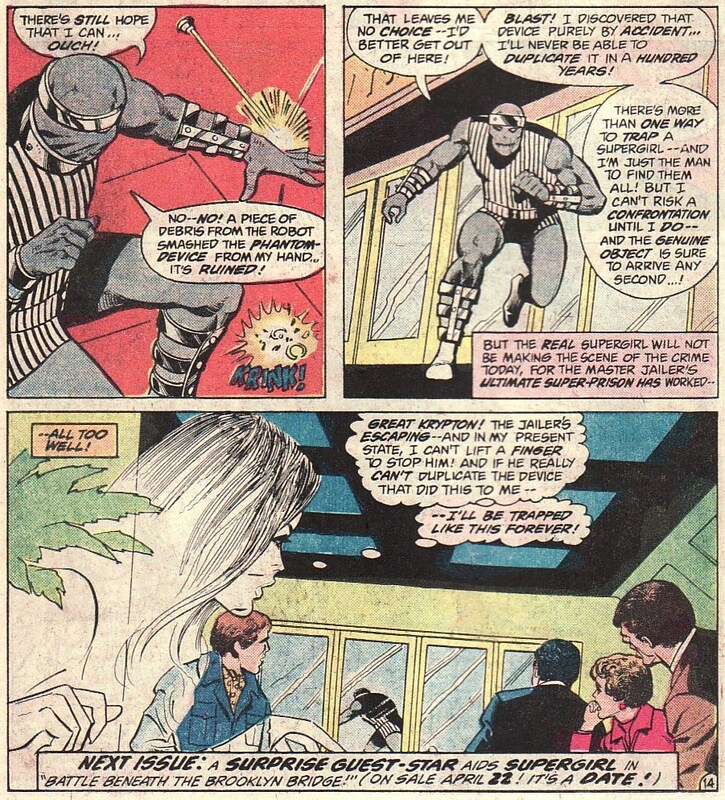 Styx needs Terrance to help find and defeat the League because the presence of Supergirl and Tina/Batman wasn't anticipated. I still think this is some nexus of intersecting realities given the multiple continuities seen. 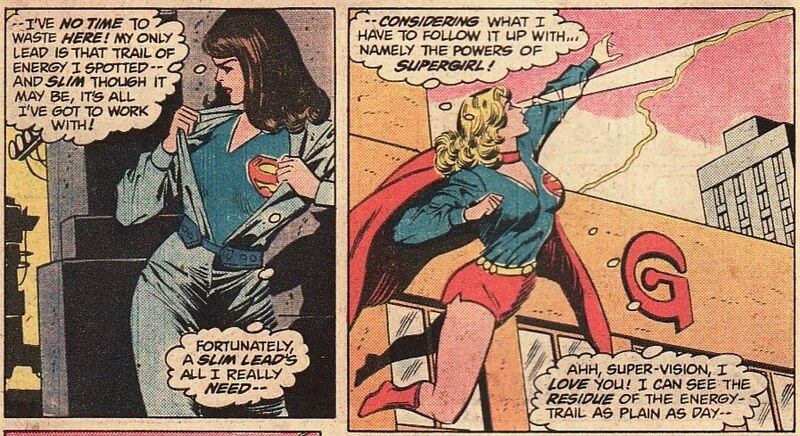 Maybe a pre-Crisis Silver Age Supergirl wasn't anticipated in this future? Whew! This is what a bold new direction is supposed to be, keeping the foundation of a book but shaking it up. We have a new universal threat, infused with Legion of Super-heroes elements (hurrah!). We have an unsteady team, hiding away, and being led by a young Supergirl. And we have versions of classic characters tossed into the mix of a dystopia. It all works. So if you are looking for a jumping on point, a place to swim in the deep end of DC mythology, this is the issue for you. 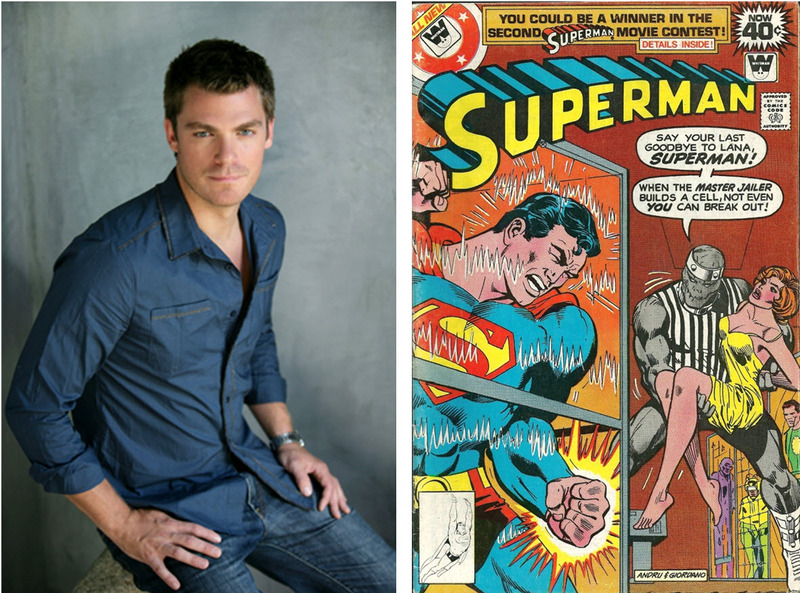 Last week, a flurry of Supergirl show news came out including Jeff Branson guest starring as The Master Jailer. The show Jailer was staff on Fort Rozz. But I remember the pre-Crisis Master Jailer very well. Carl 'Moosey' Draper grew up in Smallville with Clark and Lana. A bit portly and picked on in his youth, Draper grew up, got in shape, and became a brilliant jailer, creating hi-tech cells individually designed to contain super-villains. 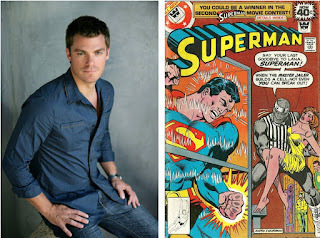 Unfortunately, he also was obsessed with Lana Lang and had a deep-seeded hatred of Superman for presumed past affronts. 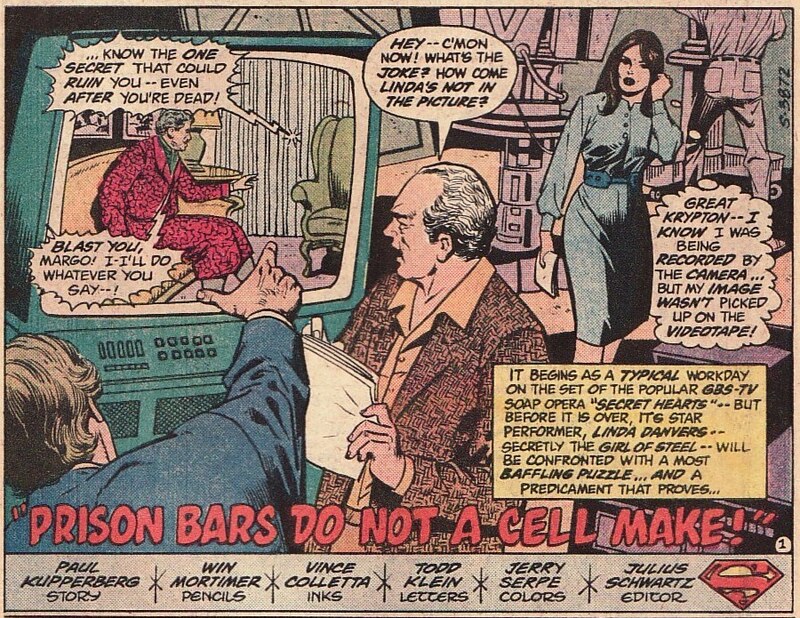 But the show isn't the first time that the Master Jailer has battled Supergirl. 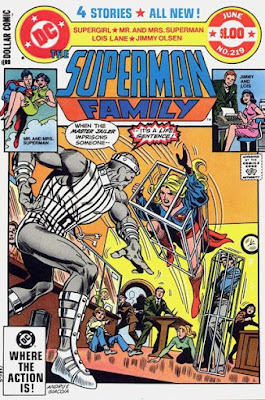 Back in 1982, the Maid of Might and the Master Jailer fought in an epic three-parter in Superman Family. As I try to link back issue reviews to current news, I thought now would be the right time to dust off these issues. I'll review each issue individually. I will also add that the first appearance of the Master Jailer showed that he was driven and brilliant. He had built his cells to drain the villains of their powers and feeding those powers into his suit. In this story, he is a bit more of a gimmick-laden thief. Sure, his traps all are prison-related. But he lacks that unhinged drive I saw in him before. 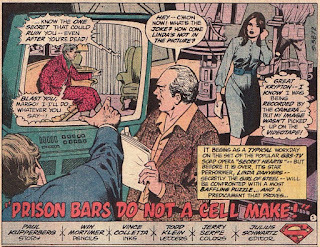 "Prison Bars Do Not a Cell Make!" was written by legendary Supergirl scribe Paul Kupperberg with art by the then standard Supergirl art team Win Mortimer and Vince Colletta. The story opens up on the set of Secret Hearts. 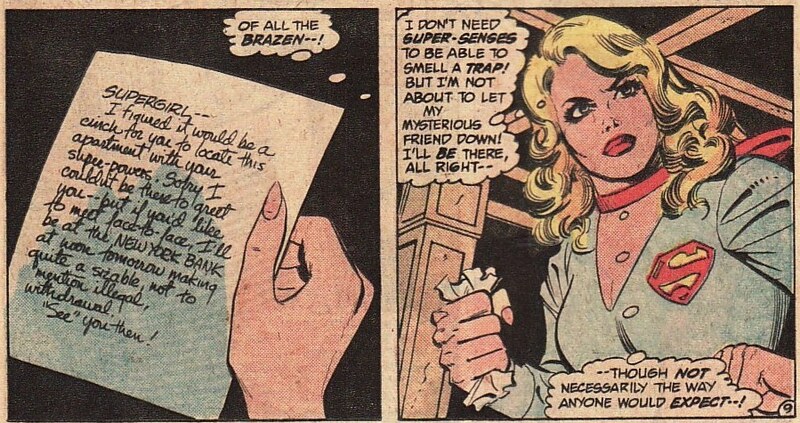 This was the time in Supergirl's life when Linda played the villainous Margo Hatton. But something isn't right on the set this day. While Linda is visible in real life, she is missing on all of the tape the crew shot that day. Immediately, Linda thinks that this must be some odd attack on her as Supergirl. Luckily she is able to convince everyone she is missing because of a technical glitch. The scenes were reshot and this time she can be seen. Using her supersenses, Linda discovered a weird energy bathing her on the set. With her work day done, she changes into Supergirl and follows the residue. It seems to me that Mortimer must have had a 'Linda disrobing' clause in his work contract. There is almost always a panel like that first one in his stories. 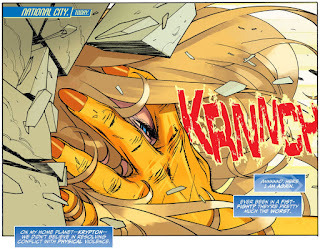 Halfway to the origin of the energy, Supergirl happens across a building which is collapsing. Like a hero, she puts her personal mission on hold to help save the people still stuck within. Unfortunately, she suddenly becomes intangible. Thankfully, her other powers still seem to work. So she is able to use her super-breath to gently blow the trapped kids to the ground. Now that is some elegant use of that power. I don't know how to tie her invisibility on video tape to intangibility. But I guess I'll roll with it. After saving the kids, Supergirl becomes solid again, adding to the mystery. The energy trail dissipates but seems to point to an innocent city apartment which seems empty. Heading back to her apartment, Linda meets with her agents and the show writers. They decide to crank up the nastiness making Margo even more loathsome. They think that pretty soon people will want a Margo doll that stabs you in the back. 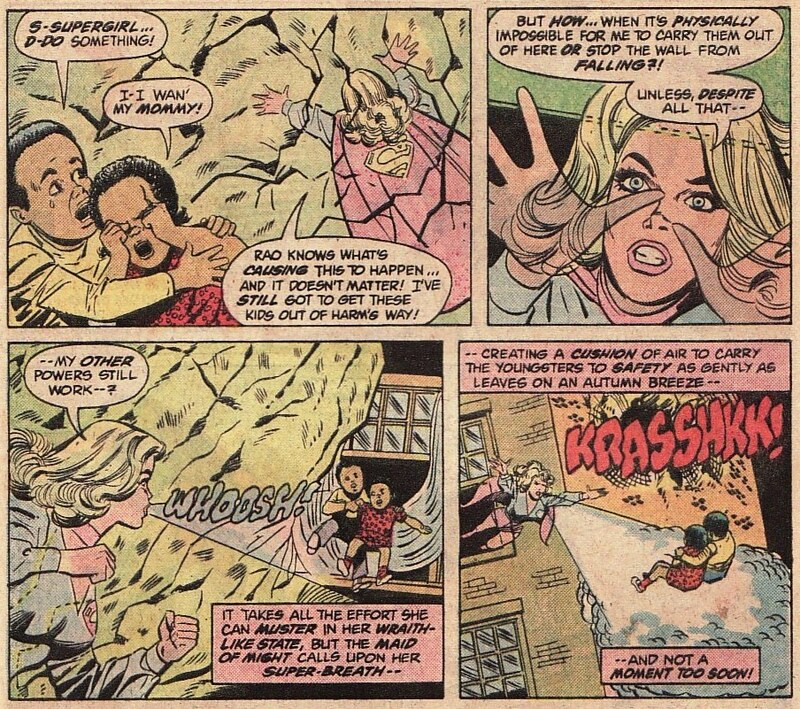 With things taking a turn for the worse and intangible, Supergirl decides to investigate the apartment. There she finds the device which was bathing her in the energy as well as a note goading her into action. Destroying the device with her heat vision, she is suddenly solid again. And she isn't too happy. Remember, this is a more fully actualized Supergirl, about to embark to Chicago. She isn't going to back down or worry. She is going to face this threat head on. Well ... sort of head on. 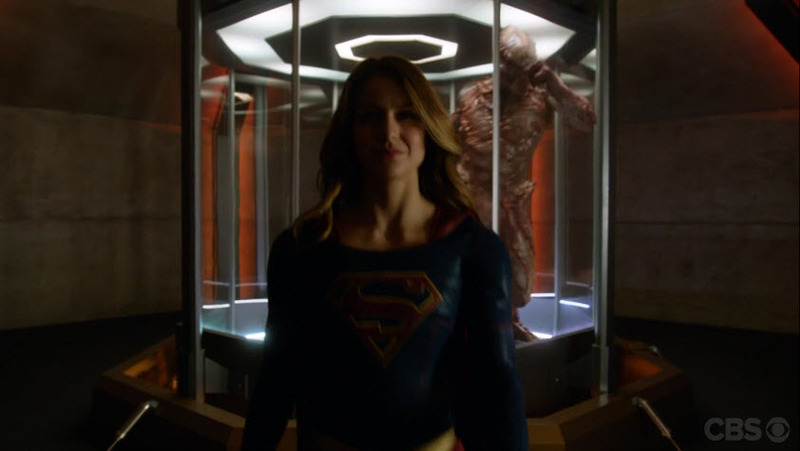 The Jailer is surprised to see a solid Supergirl there. (Should he be surprised? He left a note meaning he thought she would find his machine. Maybe he didn't think her heat vision would work.) So he uses a wrist model of the device to try to turn Supergirl intangible again. The device has been calibrated to her unique body signature. In a neat turn, the device must have a range of effect because Linda, in the bank, suddenly becomes a ghost. As I said above, the Jailer here is more of a gimmicky villain, including having a prison key gun. But the robot keeps doing what it is supposed to do, saving people and acting like Kara. Unfortunately, the pollution of the time interferes with the robots mechanics and it begins to shut down. The Jailer takes advantage and ends up blowing up the robot. 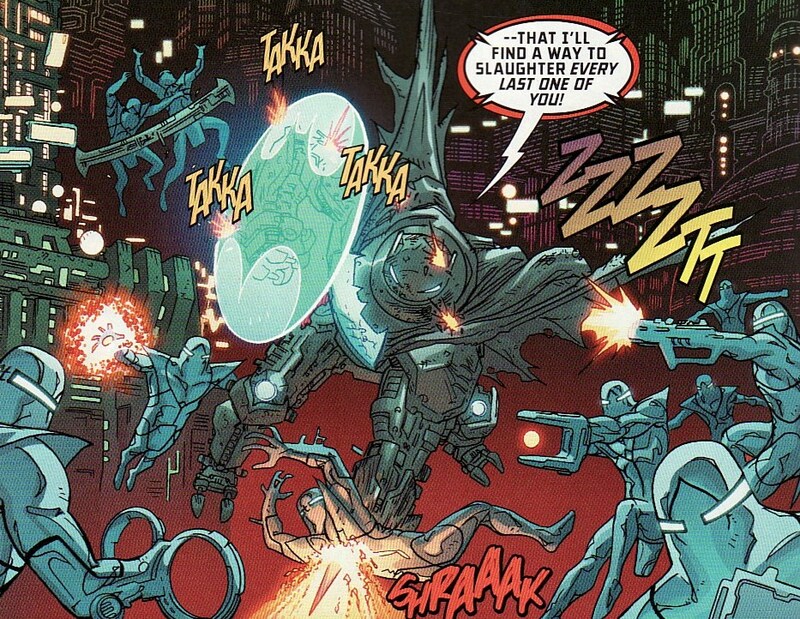 A piece of the robot hits the controls for the 'phantom device', the tech the Jailer had used to turn Kara intangible. Kupperberg does a good job throwing in a line that this device was made with some dumb luck. Draper will never be able to recreate it (thus eliminating it as a potential plot in a future issue). Scared that the real Supergirl might be nearby and solid, Master Jailer takes off. 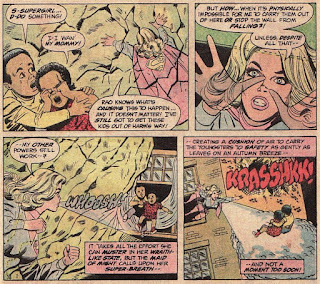 Unfortunately, the device being destroyed also means that Supergirl is trapped as an invisible, intangible ghost. How will she get out of this predicament? Well, she'll need some help from a guest star, one that I'm sure won't shrink from the responsibility of helping Supergirl. Overall this is something of a messy story with crazy plots and wacky devices. But for me, the biggest disappointment was devolving the Jailer from a bitter super-genius to a bank robber with a theme. Given this is part one of a three parter, I will review the next two issues as we approach the Jailer's approach on the show. 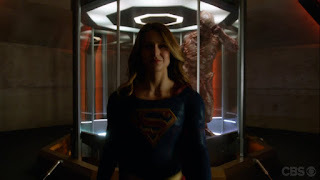 Episode 11 of the Supergirl show, came out this week and I have to say, this show continues to impress me. Last week, we had the character-driven 'Childish Things', an episode which gave back story and dimension to Winn. 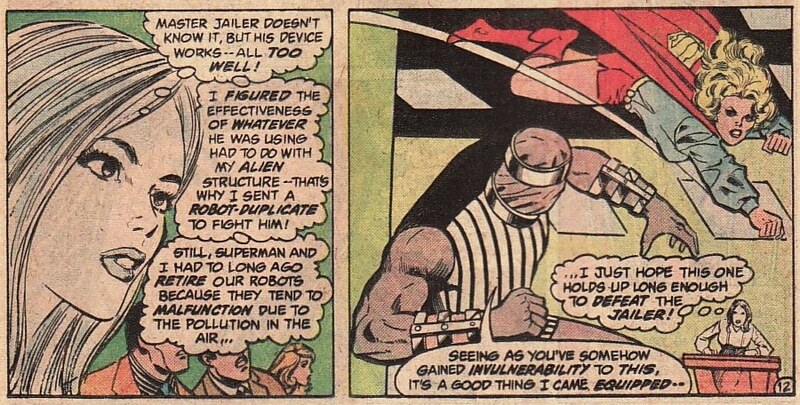 This week's 'Strange Visitor From Another Planet' similarly gives Hank Henshaw/J'onn J'onzz some much needed history. I feel like these last two episodes have really made me feel like this show has finally found it's legs. Things have been improving, characaterization has been better, stories have been more complex. Much like the evolution of the first season of the Flash, the initial episodes are very good. Now this show feels special. The title of this episode is a classic reference to Superman, taken from the title sequence of the old Superman television show. Here, it references J'onn. But it also clues the viewer in that there are similarities between J'onn and Kara. They are both strange visitors, they both have had to deal with tragedy, they both have been in hiding. And in this episode we see how they react to that history. Once again, Supergirl is the inspirational figure here, helping people to rise up. Their stories clearly deal with family and the loss of family. That theme is nicely explored in a more standard fashion with the other plot line in this episode, Cat being reunited with her estranged son Adam. Unfortunately, I was so interested in the J'onn plot that I wanted these scenes to simply end so we could head back to the main plot. That isn't a knock on these scenes as much as praise for the Martian plot. 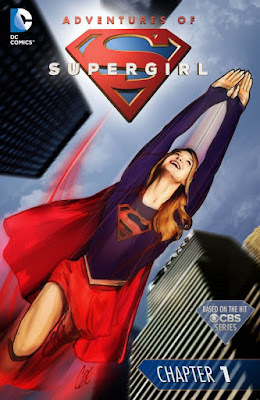 The episode starts with a simple super-heroic rescue by Supergirl. She is flying in a red-tinged, smoke-filled sky. 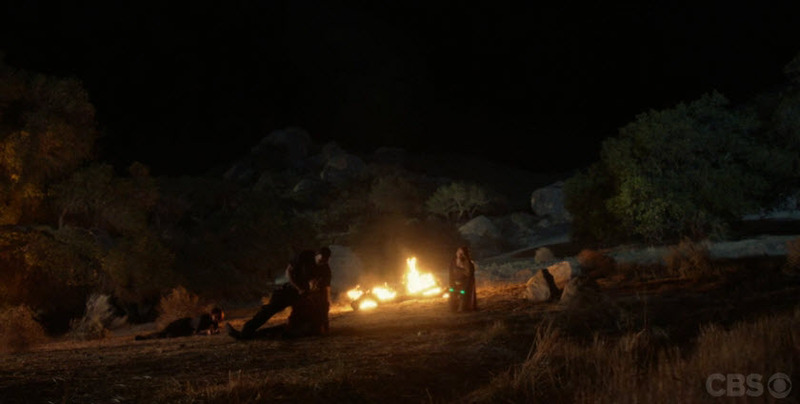 We see that she is hovering over a forest fire and has to rescue a family whose camper is surrounded by flames. For me, knowing this was the 'Martian' episode, I thought this scene with Kara flying over what appears to be a red planet, having to save a family from fire, seemed to be a sort of prologue or a sort of riff on Mars and the battles there. I wonder if this was intentional. But the biggest thing for me in this scene is that we see that Supergirl now wears blue bike shorts under her skirt. Way back in 2008, the inclusion of bike shorts set of an internet wildfire of its own. The battles were covered at length right here on this blog. As for me, I loved them. They make perfect sense. Raise a glass Jamal Igle! 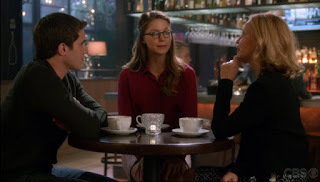 On her way to work, Kara picks up Cat's latte and meets a handsome young man who has rough opinions of Ms. Grant. When Kara hits the office, she sees the man in Cat's office. It is Cat's son Adam who has arrived to National City because Kara ghost-wrote a letter as Cat to him, saying that she regretted giving him up and asking for a reconciliation. It takes Cat seconds to realize that it was 'Kira' who wrote this. Initially, Cat is enraged and threatens to fire Kara. 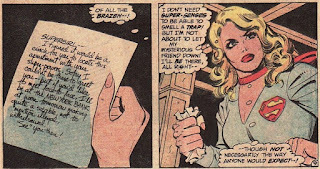 But Kara explains that she had seen Cat write versions of that letter and throw them out. It is clear Cat wanted a second chance, something Kara can't do with Alura. And so she decided to help her boss face the past. It's what family does for each other. There is that family theme. Realizing that Adam did come and this is a chance, she allows Kara to keep her job. National City is preparing for the arrival of Senator Miranda Crane, a very Trump-like figure. In fact, the writers hit you over the head with their similarities. Cat describes how Crane is a bigot and needs to be taken down by her own words. Crane gives a speech in front of a frenzied crowd. She talks about aliens threatening our freedoms, acting dangerously, being parasites on the country, and eating children. She talks about building a dome. It all sounds like Trump talking about illegal immigrants and needing a wall. The rally is interrupted, ironically, by an alien. A white Martian. The effects here are pretty good. The Martian in terrifying. James Olsen is there covering the rally, trying to worm his way back into the field. He hits the modified signal watch telling Kara she needs to come. More importantly, Hank and Alex are there as DEO protection. When the White Martian shows up, Hank freezes. It is clear he is rattled by this thing. 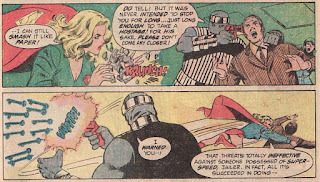 The Martian grabs the Senator and flees but Supergirl seems to scare it off. The Senator is found alive and brought to the DEO headquarters for protection. It is there that Hank reveals this was a White Martian, the group which slaughtered the Green Martians, burning them. J'onn is the last Green and clearly this White wants to finish the genocide. It was when J'onn used his telepathic powers in last episode that the White Martian detected his existence. I loved the end of this scene. Hank pulls Kara aside and tells her that if he reveals himself as an alien, his life as Henshaw will be over. He needs Kara to take down this threat. Steely, Kara replies that she's got this one. J'onn is not alone. While this again touches that family theme, it also touches on a subtheme of survivor's guilt and the loneliness of being the last of a race. It turns out that the Senator Crane brought into the DEO is actually the White Martian in a shape-shifted form. She is forced to reveal herself, battering her way through the DEO troops, until finally driven away by an arriving Supergirl. Once again, Hank panicked and froze. While Alex and Kara try to support J'onn, including a wonderful, tear-soaked scene between Alex and Hank. Again, the two talk about how he isn't alone in this. They can help. Hank then reveals his life on Mars. The Whites overwhelmed the Greens with technology. They rounded the Greens up into concentration camps. The men were forced into slave labor. The women and children were killed in furnaces. J'onn saw his daughters taken away. He escapes. He lives. And he is ashamed that he is alive. These are heavy concepts and emotional scenes. Which makes the following scene of Cat and Adam trying to make headway in repairing their relationship seem a little small. After a failed initial lunch, Kara steps in as a mediator. Cat sort of curses the 'sunny Danvers sentimentality'. But Kara is able to bring the two back together. Finally Cat says she is sorry that she gave up Adam. She misses him every day. She is glad he is here. And he finally talks about how he was angry and Cat. But also missed her. These are fine scenes, if maybe a little overly emotional. But when you go from survivor's guilt and genocide, a 'normal' troubled relationship just pales in comparison. 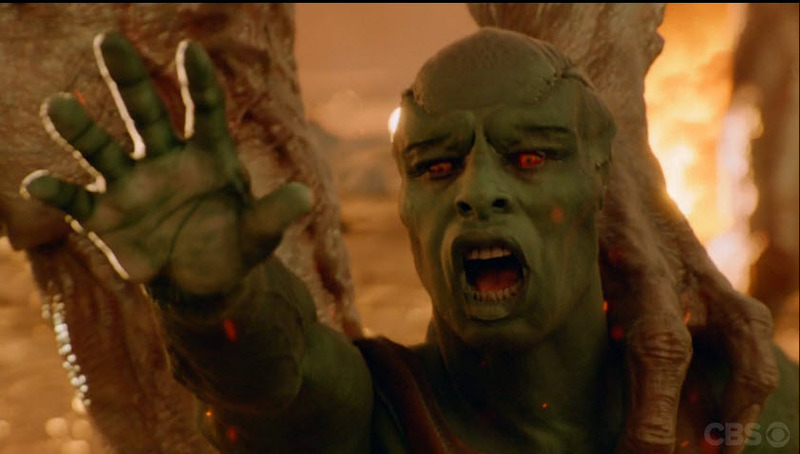 Using his powers, J'onn is able to vaguely pinpoint where the White Martian is. He vows that he will kill this alien, a blood thirsty comment which worries Alex. Splitting off, J'onn stumbles into a slimy Martian nest and finds the real Senator Crane, still alive. Alex finds another Senator Crane, which once again turns out to be the disguised white martian. The reveal is terrifying! Good luck sleeping tonight! Alex is kidnapped to use as bait to lure J'onn out. Surprisingly, the White doesn't know that Hank is J'onn. Do Whites lack telepathy? The White has a simply idea. She will release Alex if J'onn will meet her and die. Incredibly, J'onn agrees. He talks of how weary he is of being the last Green. He is ashamed that he lived while his family died, how he failed them. He will save Alex by allowing himself to be murdered. Supergirl stops him briefly and talks about how their lives are similar and they need to rise up. Their lives have happened. But "we don't choose, we fight!" "Dying is a lot easier than getting up when the world is ending. You have to get up!" Supergirl even talks about how she now knows that Alura didn't join her in that rocket because Alura felt guilty that Krypton was dying. Alura's shame led to a meaningless death. And any meaningless death is wrong. These are pretty tough words about Alura for Kara to say. She has hero worshiped her mother. So this shows some maturity. 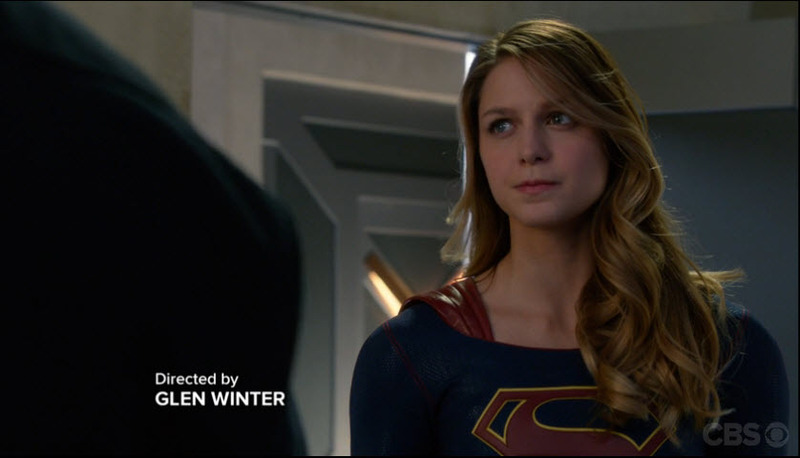 And Melissa Benoist really shines here. She seems to teeter on tears throughout this speech, bringing some emotional heft to it. Still, J'onn flies off to the desert. Just as it seems that he has given himself up, Kara arrives. The two brawl with the White, eventually overpowering her. She is defeated and can be brought into the DEO. Except J'onn is still dealing with all the emotions of his past. 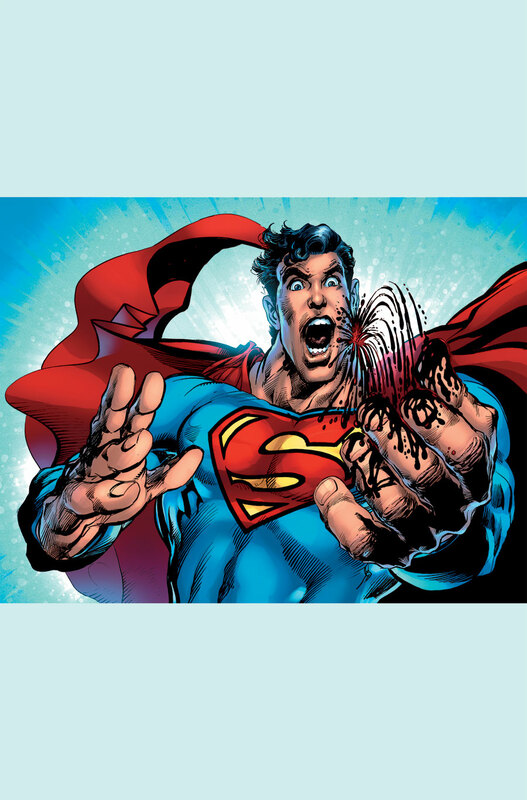 He slaps Kara into Kryptonite cuffs so she is weak and walks to the White to slash its throat. Again, Supergirl gives a great impassioned speech. She talks about how she has lost everything and everyone. That loss can make a 'hole in your heart', but you can't fall into that hole. You need to fill it. Benoist shines when she gets these speeches. But more importantly, it shows that the writers get Supergirl. She is the optimistic force of good. She is an inspiration. She sees the best and rises above. But she also has that fierce side to her when she sees injustice. Hank doesn't kill the White. Instead it is now a prisoner in the DEO. I got chills, especially as she stormed out of the room, half smiling. There is nothing left but the wrap-up. Kara and Winn are giving each other space. Adam will stay in National City to be with Cat. He also asks Kara out on a date. Senator Crane turns down the ardor of her anti-alien agenda. She says Supergirl has changed her, shown her that fear cannot dictate the future. And, in what seems to be a standing scene, we see Alex and Kara catch up on Kara's couch. They talk about Adam, Kara's desire to save everyone, and how Kara needs to have fun on this date. But that breezy conversation is interrupted by a news program showing Supergirl tossing cars around. Hello, BizarroGirl. There are other small things throughout the episode which made me smile. A version of Hall and Oates 'Maneater' plays during the first Adam/Cat lunch. Hank talks about Crane's fear of aliens being a 'comic book delusion'. J'onn says he is 317 years old and knows languages human mouths can't speak. And there is even a seen where J'onn and the White speak Martian!! These flourishes are appreciated. So this was another strong episode. The emotional scenes between Hank and the Danvers sisters were powerful. The action sequences were done well (even if dimly lit sometimes). But most importantly, Supergirlwas such a strong inspirational figure here. Well the wait is finally over. With the cancellation of the main title and the onset of the television show, plenty of fans (myself included) were wondering when DC would pull the trigger on a new Supergirl book. Finally, DC announced a digital first book, Adventures of Supergirl, written by Sterling Gates with a bevy of great artists, and Cat Staggs on covers. What a complete win! Now, after waiting what has felt like an eternity, Adventures of Supergirl Chapter 1 was digitally sent to my computer. And thankfully, it lived up to my high expectations. 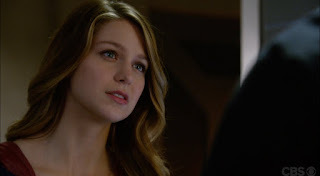 Gates immediately shows that he still has a sense of Kara's voice, even if this is a different version of Supergirl than the one he wrote years ago. He drops us right into the middle of a battle which also is a nice hook to keep the reader turning the pages ... umm ... scrolling the screen. We get exposition and back story all while a tremendous super-powered brawl is happening. It is the best of all worlds. Bengal's art is brilliant here. The action sequences are well done with blurring or movement lines to really add to the impact of the brawls. But the quiet panels of a smiling Kara, her body language, really adds a lot to the feel of the story. Lastly, Staggs' cover is poster worthy and tremendous. One thing I always like in comics is when creators take some risks. 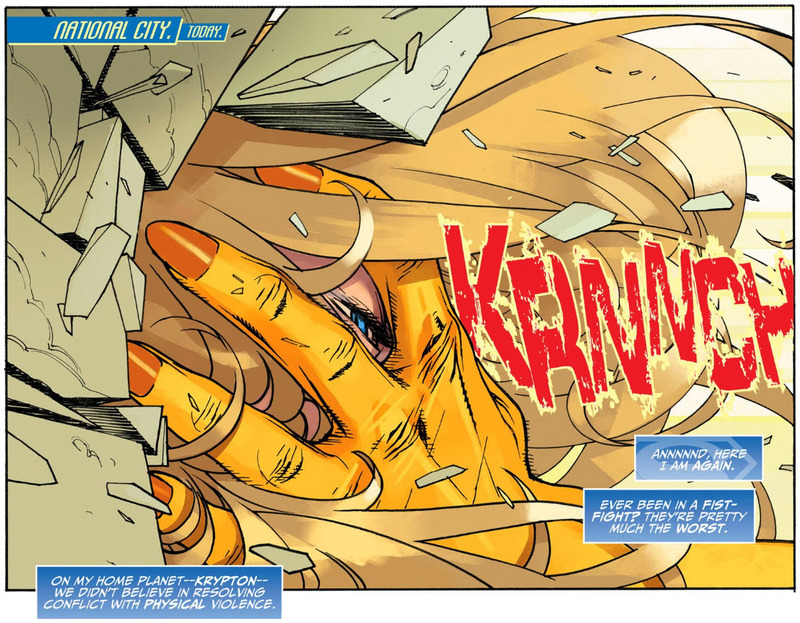 In this case, I love that the first panel is Supergirl getting her face pushed into a wall. You barely get the sense it is Supergirl, just the clue of that blue eye between the fingers of the opponent that let me figure out what is happening here. 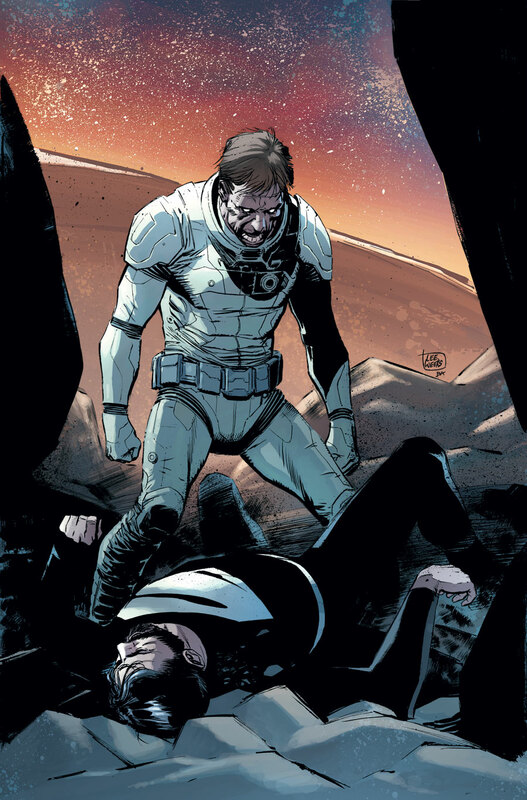 So for me that is a fun risk, opening up this comic with the image of your hero being crushed. There is some nice internal monologue cluing in the reader that Supergirl was raised with the belief that violence is a last resort. That communication should always be tried first to defuse a situation. And we have seen this in the show with Kara trying to talk to all her opponents, offering them help, before battling. But this beginning ... I almost expected her to say 'this is my life', the tag line of Gates' prior run. The villain is Rampage. In the comics, this is a sort of Hulk character. Kitty Faulkner, a STAR scientist, becomes this super-strong, enraged monster when upset. So this is a nice match-up for an opening battle. I do love how Rampage only seems to be able to say her name 'Rampage'. Sort of silly. Rampage has a sort of Dragon Ball Z feel to here (Android 16 maybe?). But this page, with this angle, plays up the size differential here. 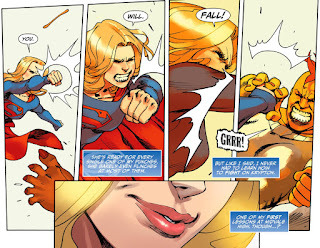 Gates riffs back to his first issue, Supergirl #34, by putting the fight in a sports arena. 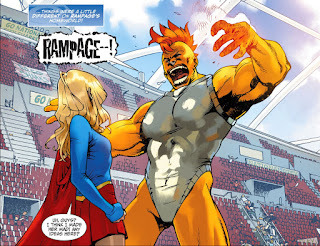 In that prior issue, Supergirl is lambasted by the fans as a bad hero. Here, she seems to be recognized more as a force of good. 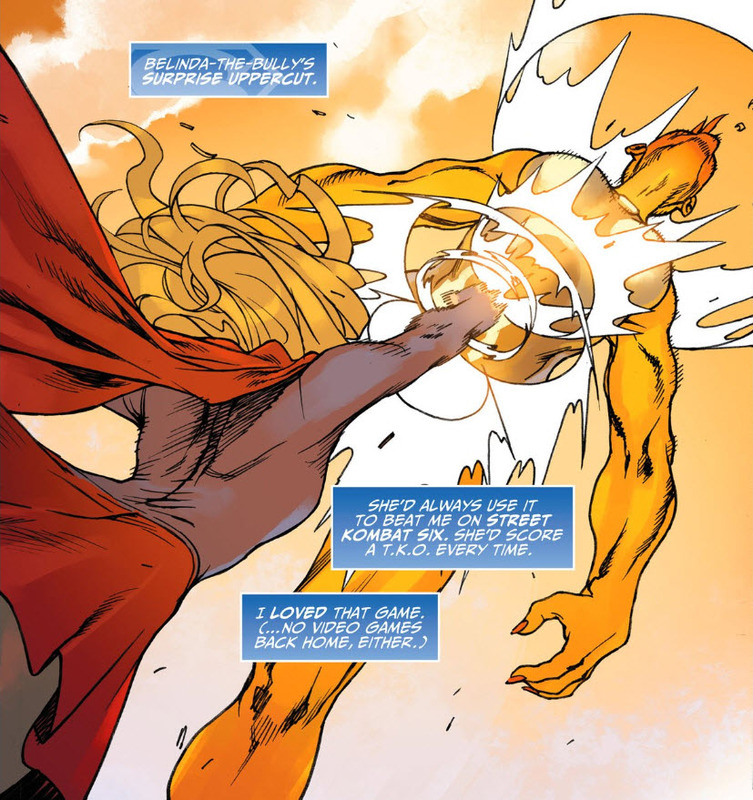 While the battle rages on, Kara thinks back to her 'origin'. These pages really lean heavily on the television show, which I think probably works nicely for people who are fans of the show and don't usually read comics. It sort of tightly links the book to the show. So we see Kara say goodbye to Alura. We see the rocket. 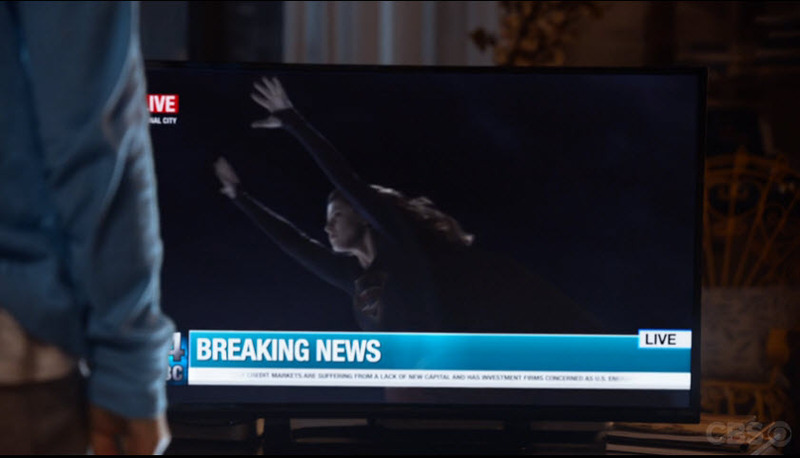 And we see Kara's plane rescue which leads her to become Supergirl, the protector of National City. You get a sense of Bengal's style here. 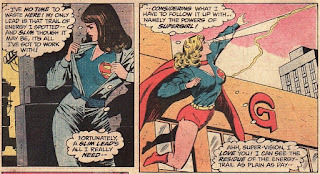 Kara's mouth is exaggerated as she saves the plane, but it works to convey the effort behind this rescue. The battle rages on, ending up in the parking lot. 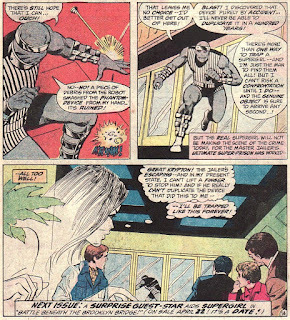 Away from cameras, Hank Henshaw calls in saying he is sending in DEO troops. But Kara doesn't want those men endangered, so she asks Hank to hold back. And then we get this nice sequence where the fight picks up. The use of small panels, with the perspective getting tighter and tighter, the colors getting darker and darker, adds to the energy of the sequence. But the thing I really liked about this was that last panel, the close up of a smile, the second such panel in the book. This is a Supergirl who is happy ... happy to be doing good, happy with her life. She thinks she ends the fight with the 'surprise uppercut', the signature move of Belinda, the bully from Midvale High. 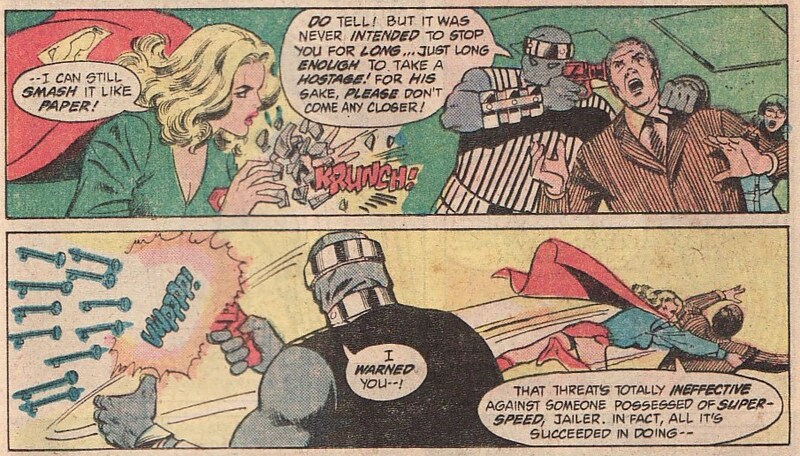 That has to be a call out to Belinda Z, the 'bully' of Landry Walker and Eric Jones Supergirl Cosmic Adventures. And a Midvale High reference? Awesome. Again, Bengal really gives us a great panel. The energy circles do have a sort of anime feel to them, a Goku vs. Vegata flavor. The angle, really looking up through the punch, adds some power as well. This whole fight sequence has been very kinetic. With the battle over, the DEO chopper begins to descend to grab Rampage. 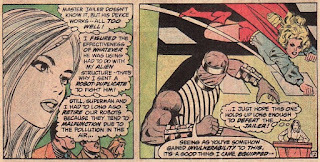 (Hmmm, is Rampage a Fort Rozz prisoner or an Earth supervillain?) We finally get a shot of Alex! Hurrah! I think my favorite panel of the story is Supergirl standing triumphantly over Rampage, looking up to her sister, beaming a big smile! That just screams 'Supergirl' to me. But the fight isn't truly over. Rampage is awake and throws Supergirl through the tail of the helicopter. It is going to crash. I felt this was akin to the opening scene of a James Bond movie. We are dropped into a conflict which may or may not have anything to do with the big plot. We get a chance to see what Supergirl can do. Plus we get her origin and some supporting cast. All beautifully rendered. I suppose I am biased but this was all win for me. Looking forward to the next chapter already! Now this was just a rumor but the idea of DC scrapping the New 52 just 4 years in and rebranding the universe to fit in with the other media versions of the characters seemed preposterous. Didn't it? Well shortly after that story Jim Lee and Dan Didio tweeted the above image. Most likely spurred by the Bleeding Cool break of the story, they probably felt they needed to get ahead of the game. 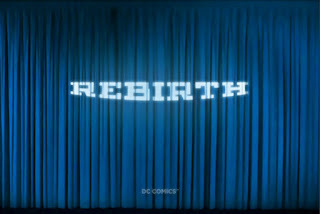 Now this is one image and one word - Rebirth - but to me it spoke volumes. 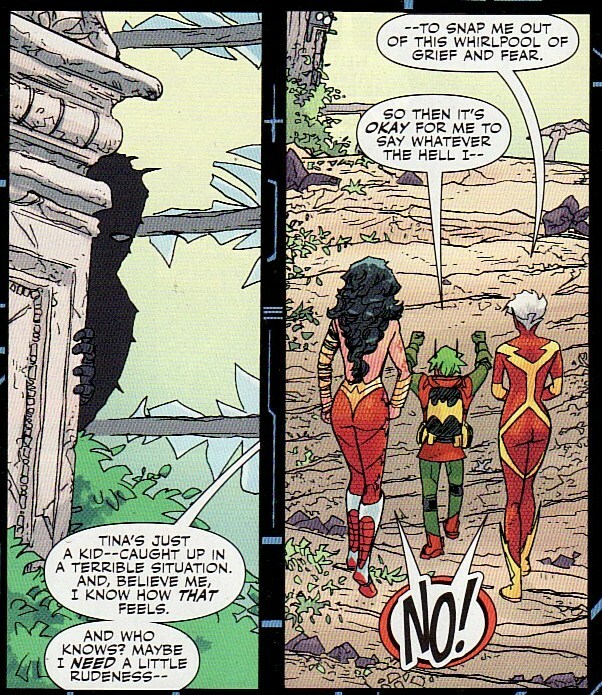 And it also spoke to how splintered I am psychologically as a DC fan right now. You see, I have long had issues with the New 52 and it's treatment of the characters I love. 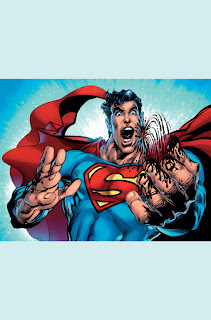 Remove Grant Morrison's initial Action Comics run and Superman has been all over the map but no where near iconic. He's been aloof, a monster, powerless. He has been away from the Daily Planet. The Kansas farm boy has decided he can love a goddess. He has had no relationship with Lois. He has been hated and shunned by Lana and Perry. And he has been hated by the people of Earth. No longer is he an inspiration to do better. He isn't trusted. Supergirl went from being an angry, cold, distant young woman who hated her family and Earth to leaving the planet, dying at the hands of her father, being resurrected, and then becoming a Red Lantern. And the whole vibe of the universe is humorless and dark. From Forever Evil to Future's End to Doomsday viruses to The Truth, I would never ever ever want to live in the DCU. So I should be welcoming a reboot with open arms? Right? I mean, I should be hoping that DC leadership realizes the mistakes it has made, wipes the universal slate clean, and gives me back my heroes. But if this is truly a universal rewrite, it also means that I have to start back from square one. And that means losing the few successes this new universe has brought me. 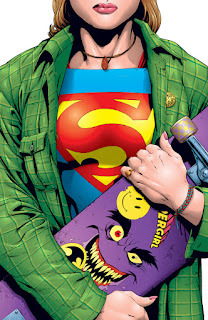 From Burnside Batgirl to Harley Quinn to the last issues of Supergirl, I have read good stories. From Starfire and the rocker Black Canary to the odd but engaging Martian Manhunter, there has been some wins in DCYou. Do I lose those books? And lastly, if the New 52 seemed like a Hail Mary pass by DC to be relevant again, another universal reboot just 4 years later seems like a pathetic grasp for readers by a leadership group who has lost my trust. 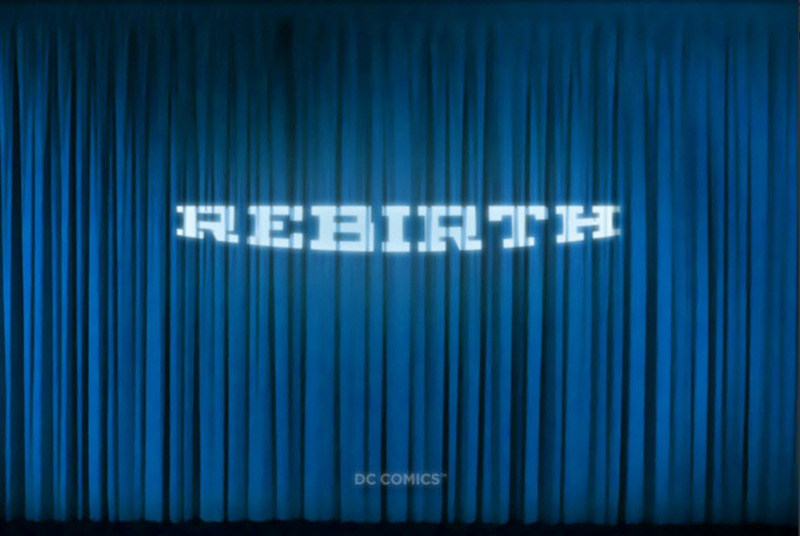 Am I honestly supposed to believe with the people in charge that this new Rebirth will be better than the New 52? Isn't the definition of insanity doing the same thing over and over and expecting a different result? If the New 52 was a perfect jump-off point, couldn't Rebirth be the 'cut the cord' moment? So the windmills in my mind are spinning. I don't like much of the New 52. I have been clamoring for change almost weekly on this blog. I should be thrilled about a change! And yet, another change this soon after the last makes me realize that right now DC is in complete disarray. It's one thing to rationalize this as something Marvel just did. It's another thing entirely when you add in this was just done a handful of years ago. There are many mantras I have used over the course of my time on this site. One I use all the time is apt here. Just give me good stories DC. I'm ready for them. 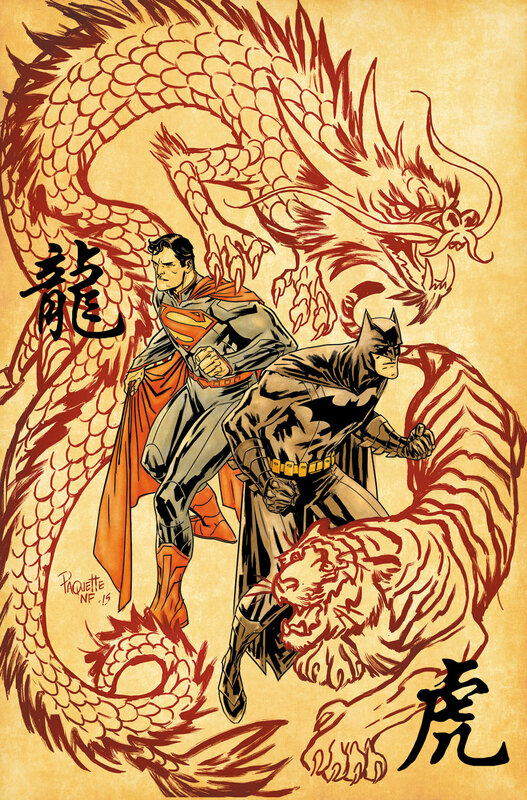 But another misstep after the line wide missteps of the New 52 would be catastrophe. So call me a Luddite if you want. Imagine me throwing wooden shoes into the gears of a factory machine in a futile attempt to stop progress. But I had never even set up an account at a site to get comics in that way. Instead I waited ... and waited ... for things to be printed. Well, if you read the first sentence, you'll notice the verb of 'had', meaning a thing of the past. Seriously, if you are a fan of the show or the character or the creators involved, you should head to whatever site you use and do this as a show of support. After setting up the account and subscribing to the series, I then had to go to Twitter to ask my friends what happens next. Apparently on Monday I go to my account and read it on my tablet. Fascinating! I'll save the big review for the comic but opening this book in a sports stadium is a bit reminiscent of Gates' first issue on the main Supergirl book. Also, I love Bengal's art on these pages. I especially like Rampage who gives off a bit of a Dragon Ball Z vibe to the proeceedings. Anyways, I promise I will let you know how things go on Monday as I scroll through the story rather than thumbing through the pages. But regardless of my digital aversion, Kara fans should be pumped for this! The big news for me was that the main universe Supergirl is finally mentioned. We haven't heard from her since the last issue of her solo title. More on this when we hit the appropriate solicit. And it is clear that DC finally realizes that the Supergirl show is a hit and they should try to cash in on her surge in popularity. The choices they are making are mixed in my mind. But more on that later too. 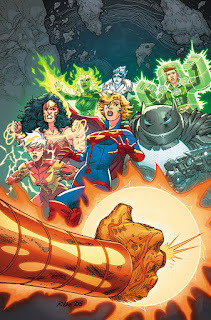 Now that the Justice League is aware of Lady Styx’s ultimate plan, the team is forced to stand its ground to save the human race from extinction. Little do they know that Eclipso is hot on their tails! Plus, the Justice League may have a traitor in its midst. 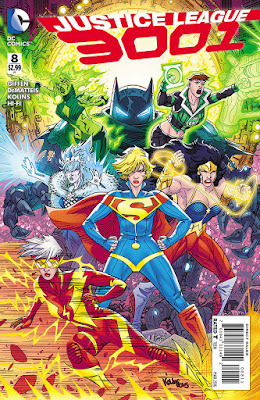 As the 'go to' book for Supergirl these days, I am glad that JLA 3001 has survived another month without the dreaded 'final issue' tagline. But I worry. Twelfth issues are a perfect spot for the axe. Giffen and DeMatteis keep pushing things in this book. I assume this is Sinestro on the cover, one more survivor from the 21st century. I keep wondering if there will be some Twilight Zone ending to this book. Like this universe is a version of comic book hell or purgatory. The first of a two-part epic finale to the first year of the war! Tenebrus unleashes an undead army upon London as the Battle of Britain begins, and Amanda Waller’s Bombshells are united at last. But will even the combined might of Wonder Woman, Supergirl, Batwoman, Stargirl, Aquawoman, Dr. Light and Big Barda be enough to protect a city under siege? Or will one of the Bombshells be called upon to make the ultimate sacrifice? As the second 'go to book' for Supergirl, I am glad this book is such a hit. I have been eagerly awaiting the time when all the Bombshells team up as a team. Looks like we are finally there. 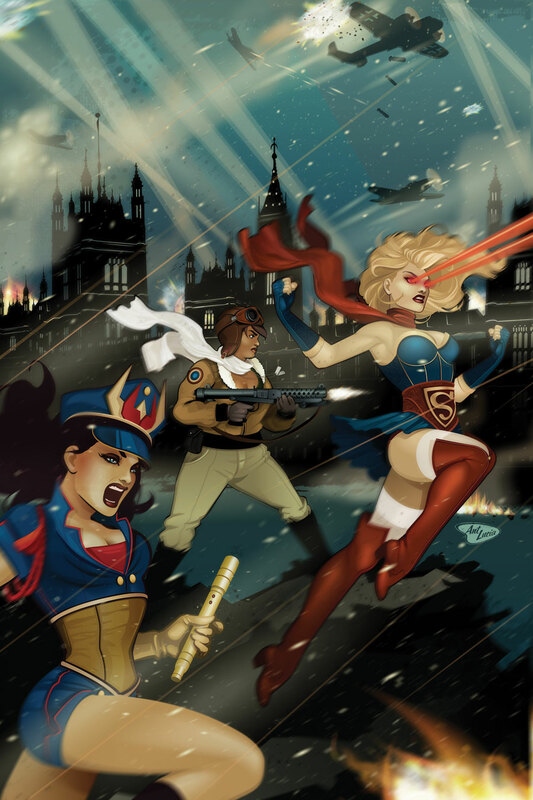 How can you not love this cover with Supergirl, a machine gun toting Amanda Waller, and Big Barda! This book has been a completely delicious treat. Superman is shocked to learn that Kara has been missing for some time as part three of “Super League” begins! Now, with Batman’s help, Kal-El is on his cousin’s trail—but he can’t believe where it’s leading him and who she has joined! Well ... I hope hurray. There are things that bother me about this solicit which makes my 'I generally don't trust the current DC to treat Supergirl right' feelings surge a bit. 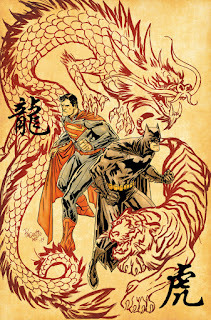 First off, Peter Tomasi hasn't exactly wowed me in recent days with his stories. Second, Clark is shocked to learn that Kara has been missing? I guess he doesn't care about his one surviving family member to keep track of her. This seems off given what seemed like a closer relationship in the closing issues of her book by K. Perkins and Mike Johnson. Third, he is surprised to see who she has joined? If they make Supergirl dark again, have her join a villain group, I'll be really disappointed. I am hoping its the Legion! Lastly, we haven't seen Supergirl in months. She is now a TV star. She doesn't merit a spot on the cover? I generally don't trust DC to treat the main universe Supergirl well. Should I have optimism? 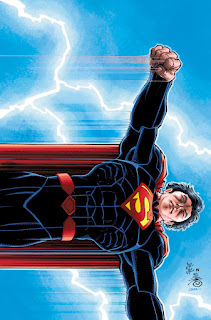 It’s the start of a new chapter in the Man of Steel’s life that will change everything you know as the epic eight-part “Super League,” all written by Peter J. Tomasi, spans BATMAN/SUPERMAN, SUPERMAN/WONDER WOMAN and ACTION COMICS in April and May! 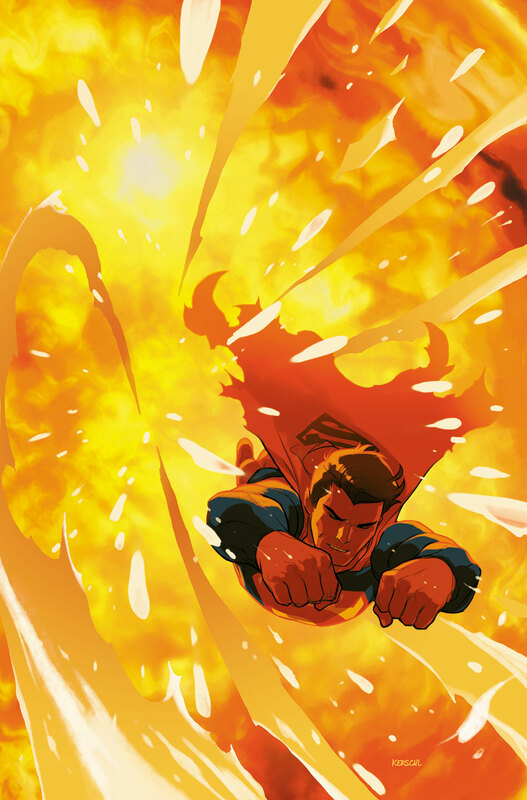 His time without powers made Kal-El realize that the world is in need of more protectors...more super-powered beings like himself. But where will he find such beings? And now the premise of the next crossover is revealed. The world needs more protectors? More than the Justice League? I hope Tomasi can deliver. 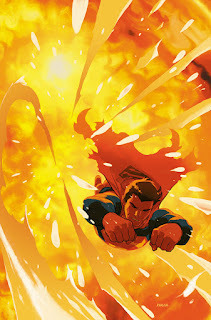 And I look forward to seeing Mikel Janin on a Superman issue. Interesting and eye-grabbing cover by Yanick Paquette here. He has been killing it in recent months on these books' covers. I wonder if this new super-being is the pre-Flashpoint Superman? Is it a new character or reboot of an older character? And interesting to see Mahnke on this book. Ed Benes is on the SM/WW book this month. The cosmic menace of Hyathis hits Earth—and this Superman may not be enough to stop her from obtaining the power of the Oblivion Stone. And is Jon starting to manifest superpowers of his own? 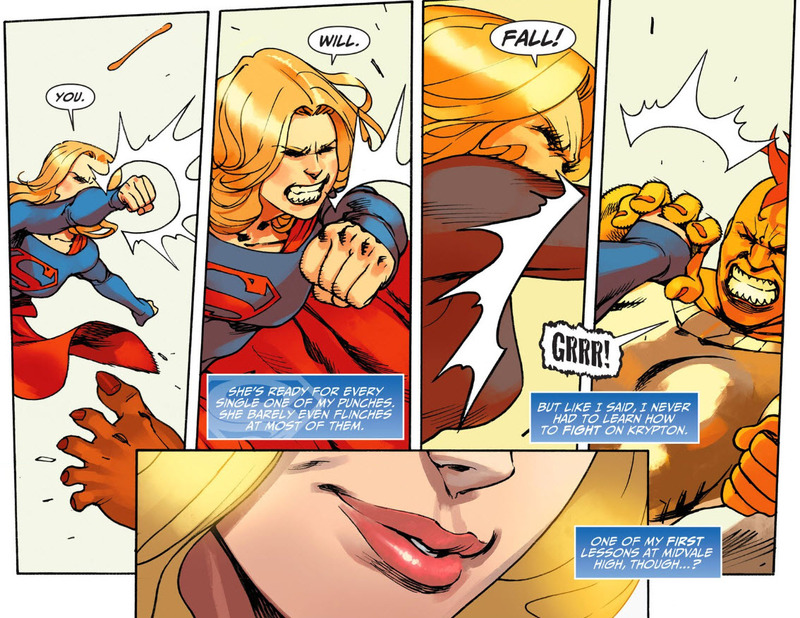 So Supergirl being back in the Superman book was the biggest surprise of the month. But this was the second. Don't ask me why I love the old DC character Hyathis but I do. She's awesome. So to see that she is one of the big bads in this book (which I also love) was a very pleasant surprise. As Superman tries to find answers as to why Darkseid’s son, Kalibak, has kidnapped a young Middle-Eastern boy and his dog, three other Kryptonians have come to watch over Earth. Meanwhile, the planet Nibiru, which became New Krypton for the liberated Kandorians, is preparing to host Darkseid as he attempts to subjugate their world to make it his New Apokolips. This book is going to be crazy. I don't know if I have anything more to say. That solicit is nuts. In this 1990s reimagining of the Girl of Steel, Lex Luthor’s familiar synthetic creation “Matrix”—who mimics Superman’s powers—merges with human girl Linda Danvers to create a new Supergirl! So why does everyone believe she’s dead? 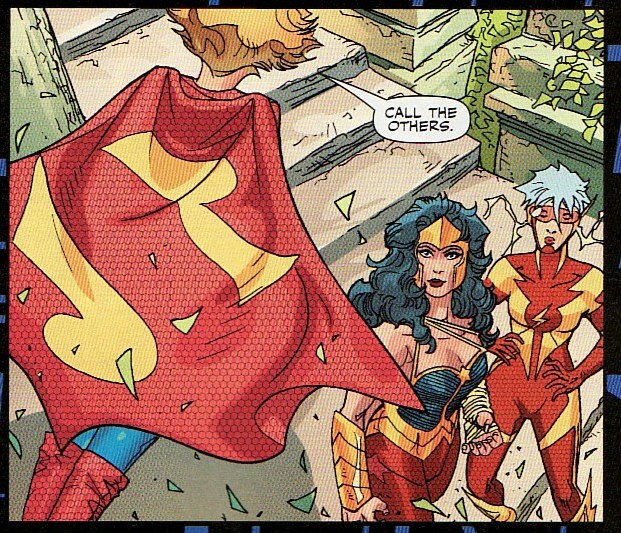 And what is the secret behind Linda Danvers’ evil past? 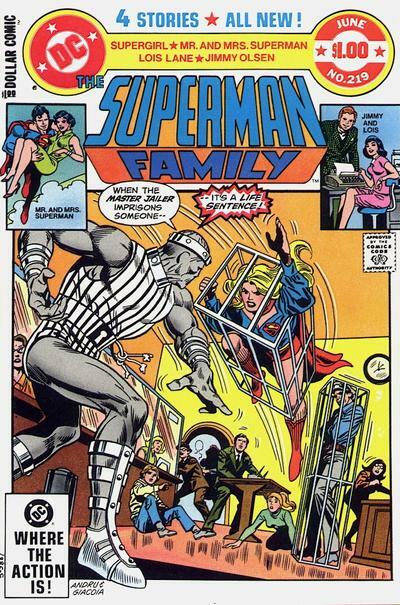 Collects issues #1-9, SUPERGIRL PLUS #1, SUPERGIRL ANNUAL #1, and a story from SHOWCASE ’96 #8. And then a couple of nice surprises. DC has been putting out more Supergirl trades and collections which is always welcome. People who come here know how much I love David's take on Matrix and Superman. So I am happy to see this trade reprinted. But unlike the last version, this one includes Supergirl Plus and Supergirl Annual #1, neither which impact the story dramatically. I wonder if these were put in as an incentive for people who own the original printing to buy this one. This isn't Kara Zor-El. But it is a great read. 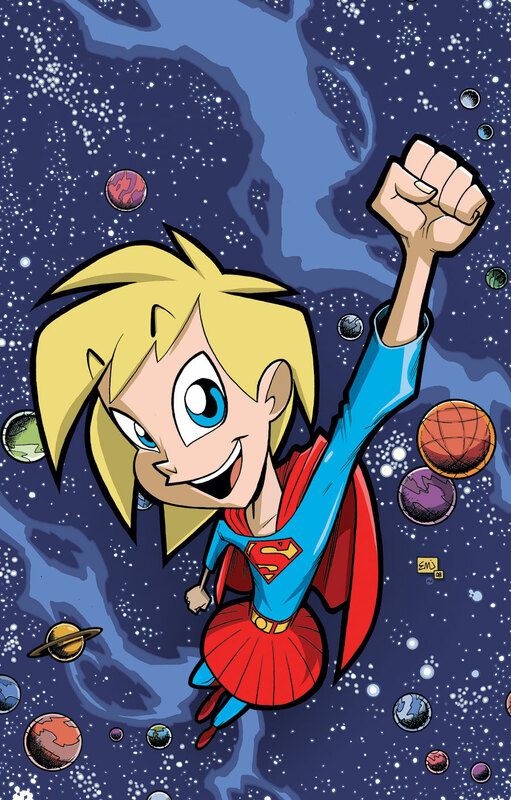 Supergirl’s cosmic adventure is back in print! 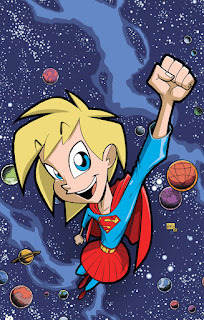 Supergirl meets Belinda Zee, a new junior high adversary, in this all-ages title collecting the six-issue miniseries. And that’s just the start of the fun that includes super-powered pets and cosmic adventure! And then another great great surprise! Another printing of Cosmic Adventures. So some interesting stuff for April. Hopefully Tomasi writes a good Supergirl.